Costanzo Ruocco is in Capri a veritable institution . 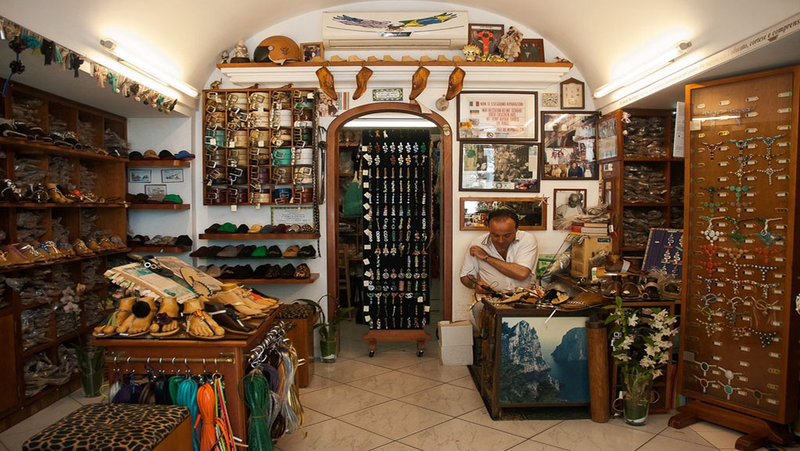 In 67 years has earned the respect and affection of customers from all over the world including the first lady Jacqueline Kennedy, Sophia Loren and Clark Gable, fascinating figures myth of the 60s .In the shop, situated close to the “Piazzetta”, you can still find the old tools used to create the typical caprese footwear; tailored sandals hand-created in a few minutes but with absolute care.Pearls, precious stones, rhinestones; various styles and a thousand reflections make sandals increasingly precious, elegant and refined. The love with which Costanzo realizes these works of art is growing day by day in his son Antonio that continues the family tradition with the same passion and competence.